This was a really good ensemble novel. I got to take a peek into several different lives and I felt like I really got to know the characters. I think the alternating perspectives helped me enjoy the novel more than I would have had the story only focused on one person or couple. That being said, as is the case with most ensemble books, there were characters that seemed to be at the centre of the novel. In this book that couple was Fran and Will. Unfortunately, Fran drove me a little crazy. She seems to think Will doesn’t care about her or their marriage anymore so she embarks on an emotional affair. It was frustrating because she didn’t have any reason to doubt Will’s feelings for her. This was one of those cases of a couple being too comfortable and not bothering to communicate. Even though I liked getting the insight into all of the couples’ lives, I wanted more focus to be put on Audrey and Coop. Also, Leland was such a fun character but he didn’t play a huge part in the novel. The only time I really got to read about him was when he was at one of the dinners and I felt like he had more to offer to the story. The monthly dinner parties provided a unique element to the novel. It was a fun way to get all the characters together and allowed personalities to be exposed a little more. For example, we can tell how important the dinner is to Jaime and she wants to make sure everything is perfect. Her husband, on the other hand, can’t usually be bothered to show up on time. It’s telling and gives a hint to the others, and the reader, that everything is not always as it seems. I finished Table for Seven with a smile on my face. I was really happy with the journey that all the characters went through and how they dealt with the issues they faced and how they changed because of those issues. 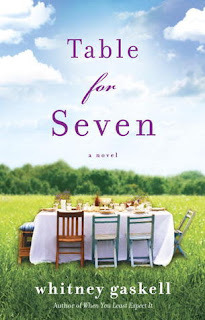 If you’re looking for a feel good novel with heart, pick up Whitney Gaskell’s latest novel. As for me, I’m going to keep an eye out for her next novel as well as taking a look at her previous books. Thank you to Bantam for our review copy! All opinions are our own.